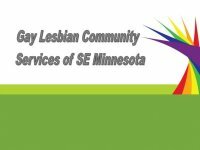 Gay & Lesbian Community Services of Southeast Minnesota will present a special screening of Inlaws & Outlaws on Wednesday, February 3, 2010 at 6 pm. The screening happens in conjunction with GLCS' annual meeting where new board and officers are elected. The film will be presented at the Rochester Public Library. and is free and open to the public. All are welcome. Gay & Lesbian Community Services is a volunteer service organization. We provide educational, informational, and social resources to the gay, lesbian, bi-sexual, and transgender communities, their families, friends, and any interested persons. In addition, we work closely with area GLBTA related groups, human and social service agencies, educational institutions, churches and other organizations so that we may easily connect you with the group or organization that specialize in the area(s) of particular interest to you." Social Hour - Every Thursday, 5:00pm at Rookies Bar (Ramada Hotel, North side of hotel complex, adjacent to TJ Maxx Plaza). All are welcome! Coffee at the Office - Every Wednesday, 7:00pm at the GLCS Office, 1500 1st Ave NE, Rochester. An informal social gathering to meet people!